Undead Prince Ricard is a Mini-Boss in Dark Souls. Prince Ricard was born into royalty, but wandered the lands in a fateful, ill-conceived journey. It is told that he became hollow and disappeared up north, where he now guards a lone tower in Sen's Fortress. Judging from his Elite Knight Armor, one can assume he was of Astoran royalty. 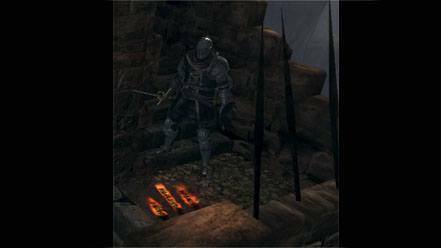 Located past the Iron Knight in the upper area of Sen's Fortress, take the path to the left of where he was standing to find a ladder. Follow the path the ladder leads to, in order to find him. Guards a Divine Blessing and a Rare Ring of Sacrifice. Ricard guards the narrow pathway and stairs to the tower. His heavy armor inhibits his dodging ability and makes it harder to miss him. He uses his bow from a distance, and up close he switches to his rapier which has a unique set of fast, consecutive stabs. He has the ability to parry using his buckler, if given the chance, so be prepared. The only real strategy here is to go ham. Bombard him with attacks, and he should go down easily enough. Where are you getting that his title was "The Archer"? No mention whatsoever is made of his archery in descriptions, just carrying a bow as a backup wouldn&apos;t really make you know as "The Archer", which would indicate significant exploits or prowess in the field, which he doesn&apos;t really display. Prince Ricard of Astora would be a more accurate title, even if "of Astora" is speculation due to his Elite Knight gear. If you trade kills with him can you still get his rapier? He is past the berenike knight not iron knight. if I remember he mid or quick rolls. I could be wrong its ben a bit since I&apos;ve killed him. I&apos;m just wondering what would his stats be if you were to rp (role play) as him.